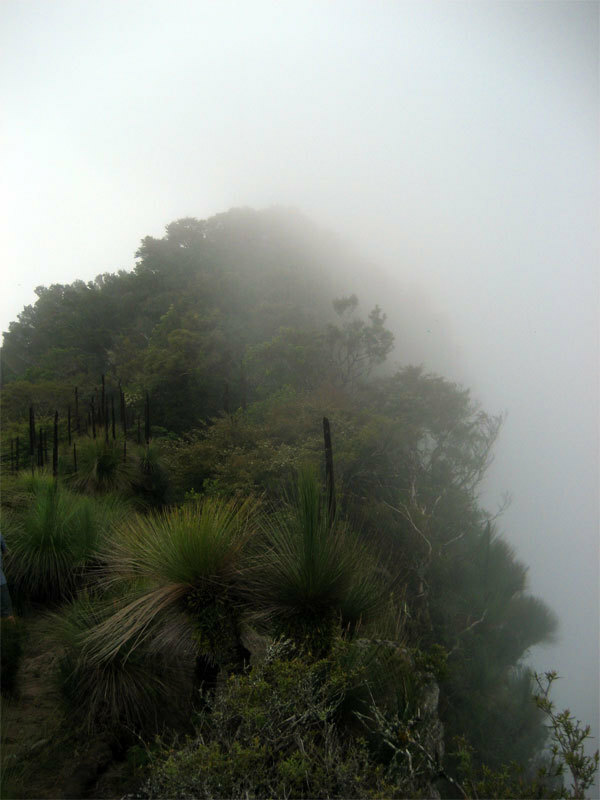 One interesting place for hikers with a range of different tracks is Cunningham's Gap. 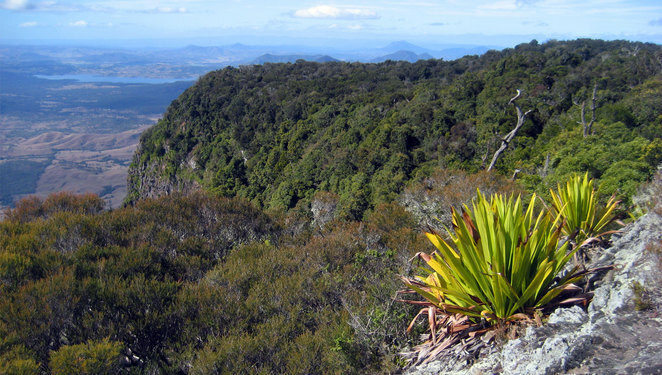 This area includes short strolls through the rainforest to great views, as well as some of the most interesting mid-length hikes in South East Queensland. There is also one hike more suited for fitter hikers. Whether you are heading here specifically to do the hikes, staying in the area or simply passing through on your way west, this is a great place to stop. Cunninghams Gap is about an hour and twenty minutes from Brisbane, and about 15 minutes beyond the little town of Aratula along the Cunningham Highway. 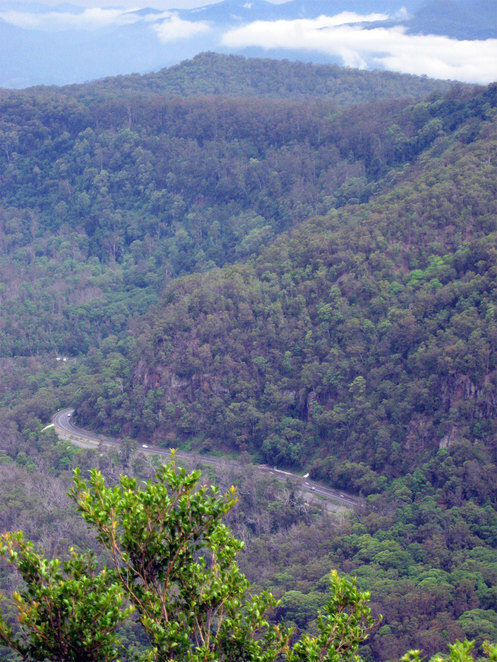 The car park for the walks lies on your right just as you reach the top of the pass through the Great Dividing Range. Pay attention as the car park is just around a bend. There is a turning lane that makes crossing the often busy highway easy and safe. At the car park there are toilets and a map of hikes in the area. Most hikes are on the car park side of the road, however Mount Mitchell is on the other side of the road. 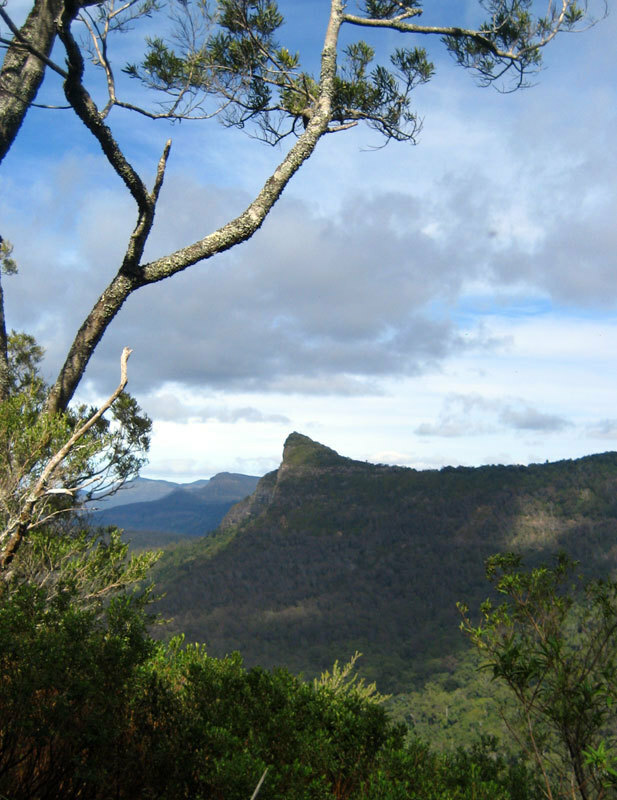 The simplest and easiest hike is the Rainforest circuit which goes to the Fassifern Valley Lookout. This 1.6 km circuit is along a well maintained bitumen path. This is the walk you take with your grandparents and little kids. It is also the walk to do if you are just making a quick stop. It is also the start of a number of other walks. 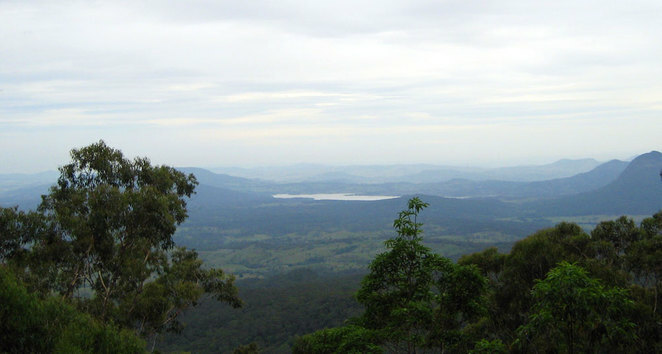 The highlight of the walk is the Fassifern Valley Lookout. If you do any of the walks to the peaks, you will have much better views, but this lookout provides great views looking down on the road leading up to Cunninghams Gap and Lake Moogerah. It is hard to decide which hike is the essential hike to do at Cunninghams Gap, but Mt Mitchell is probably my favourite. The walk is 10 km return. So basically it is 5 kms uphill to the peak. However it is not that difficult if you are reasonably fit and take your time. It is also a great workout for people who are really fit. The peak has a small flat area which falls off on three sides. There is plenty of room for even fairly large groups of people. I have seen two hiking groups up there with about 30 people in all, and there is still room for everyone to sit down and enjoy lunch. The peak gives you nearly 360 degree views of the area which makes it well worth the walk. While the path is nice, you really only have the one big pay off at the end with some other less spectacular views along the track. 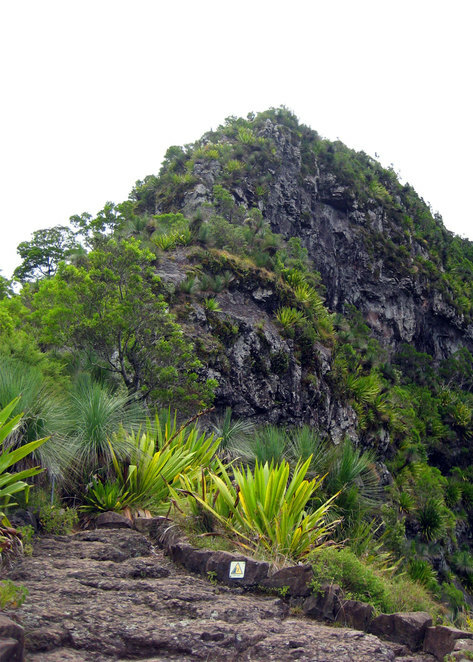 The 6.8 km hike up Mt Cordeaux is well worth doing on its own but can can be done as part of the Bare Rock Track Walk. This walk will take you past the Fassifern Valley Lookout, through very lovely rainforest with several locations that provides views down the valley and of Mt Mitchell. 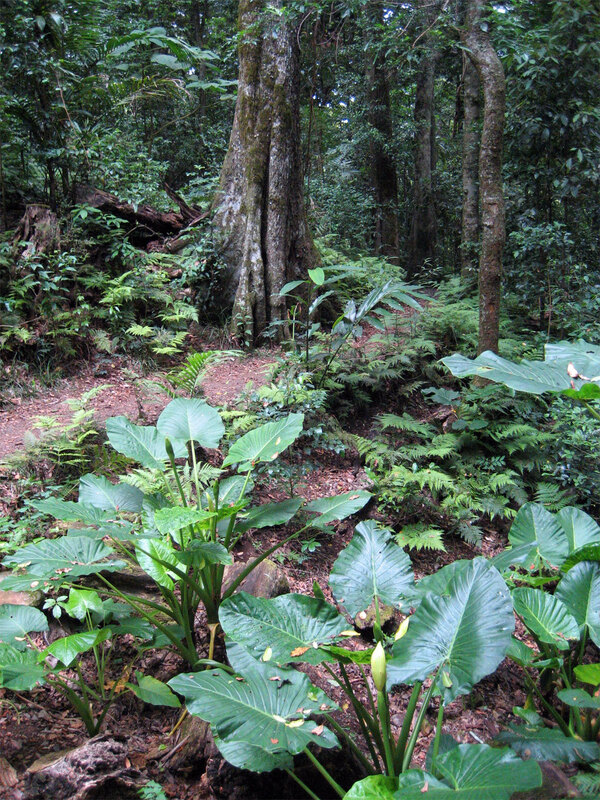 The track is well maintained with sections where you are down within the rainforest and other areas where you are looking out onto the tops of trees. There are several tracks here, but everything is well signed. Just make sure you follow the signs. The track is uphill most of the way, but it is not difficult or steep. Any reasonably fit person can do this walk if they are not in a hurry and rest when needed. With the various views, you will have plenty of excuses to stop (I am not tired, I just want to take some photos). The pay off is Mt Cordeaux itself. The views are not as good as those at Mt Mitchell, but still spectacular. You arrive close to the peak of Mt Cordeaux, but there is no track to the actual peak. This limits the view to some extent but everyone stops to have pictures taken with the peak. The peak is a wonderful place to rest, enjoy the views and maybe eat lunch (or at least a snack). With the most iconic view in the area, Bare Rock is well worth doing. This 12.5 km walk is essentially an extension of the Mt Cordeaux walk. Mt Cordeaux is basically a small diversion from the Bare Rock Track and if you are going to Bare Rock it is always worthwhile visiting Mt Cordeaux. From Mt Cordeaux the walk is mostly flat as it goes around behind Mt Cordeaux along a wide saddle to Bare Rock. The last part of the walk up Bare Rock has a short steep section, then you are on top of the Bare Rock with amazing views. Most people will want to stop at Bare Rock and enjoy their lunch. As Bare Rock itself is mostly exposed, this is a better walk to do in winter when it is not so hot. In summer most of the track is shaded so it is still an enjoyable walk at any time of the year. While not an overly difficult walk, be aware that the walk heads down the range and you have to return back up again. The walk is around 10 kms but you should give yourself about 6 hours to do this walk. That gives an indication of the difficulty some people have returning back up the track. If your are not fit, then you might want to skip this walk. While the walk leads to nice falls, it has trouble competing against the other walks with better views in the area, so few people do this walk. It is definitely something to try if you are a fitter walker and have tried all the other walks. There are other tracks in the area as well. 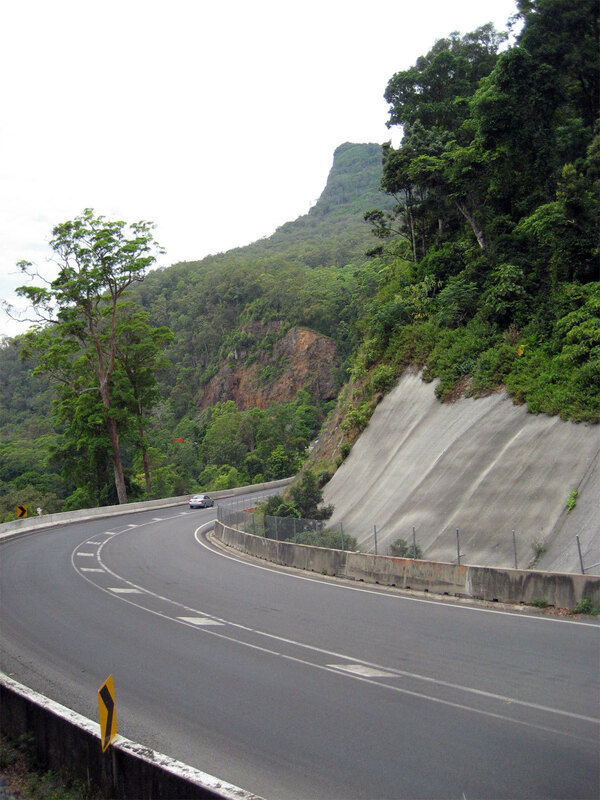 These include the Box Forest Track, Palm Grove circuit and Morgans Walk. These are all forest walks, with admittedly nice rainforest, but no additional great views, so not really worth the effort. 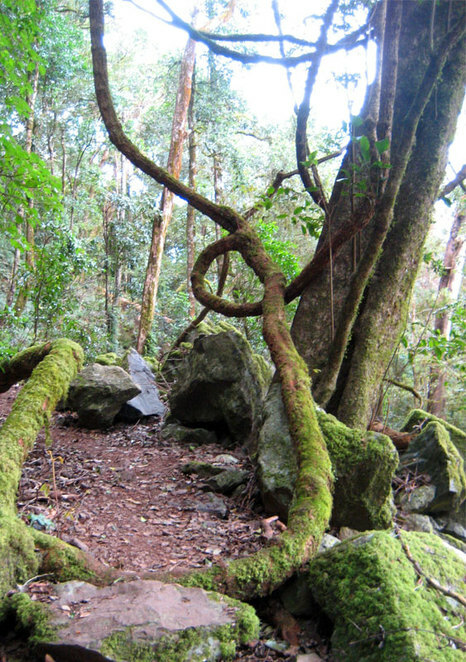 Of all these walks, Palm Grove is probably the one that is worth doing as an extension of the Rainforest Circuit. The town of Aratula is only 15 minutes drive away. 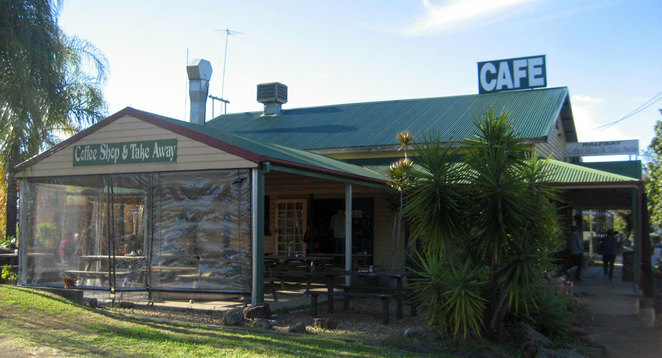 While it seems to be a whistle stop town, it has two cafes and a pub, all with good reputations. My personal preference is the One Stop Cafe which serves a very wide range of food and has a lovely outdoor seating area. 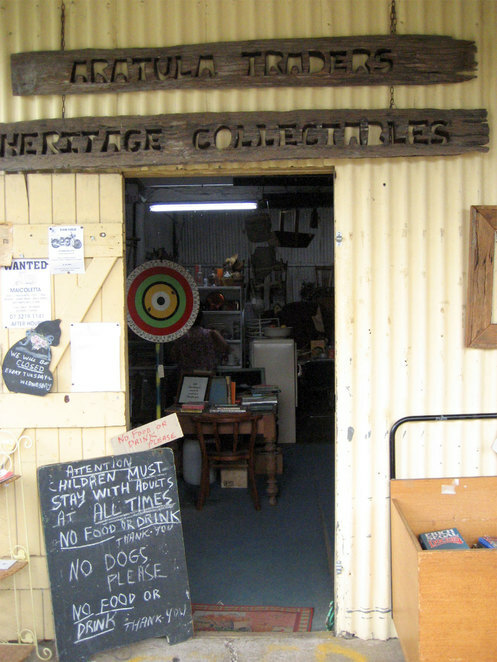 There are antique shops here and the One Stop Cafe has an adjoining local products and crafts store. The main item I shop for in Aratula is locally grown produce at the fruit shop. While not the best country fruit shop I have visited you can still get some great deals on fruit and vegetables if you make sure you are buying local. 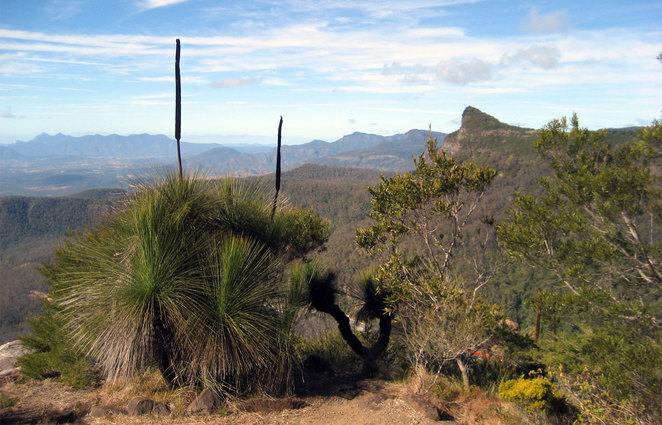 Despite having a range of hikes, there is no campground at Cunninghams Gap. 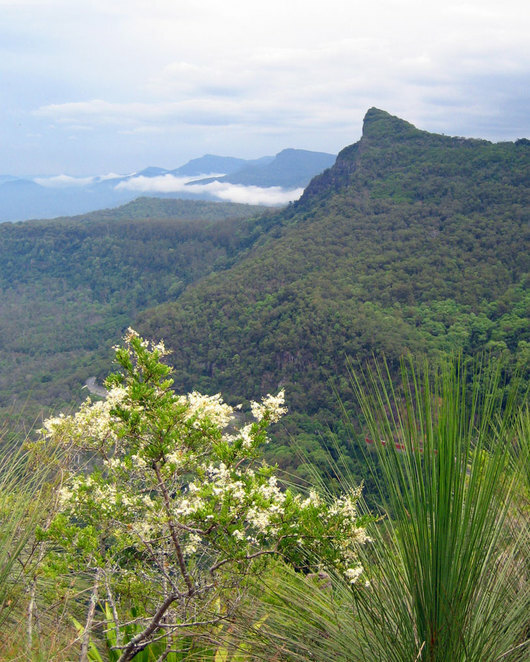 There is a campground at Spicers Gap which is also part of the Main Range National Park, but there are a number of more convenient accommodation options. The main ones are staying in the Aratula Hotel Motel or the Aratula Village Gap View Caravan Park, though a better option would be to one of the camp grounds at Lake Moogerah. Enjoyed reading the article Roy! 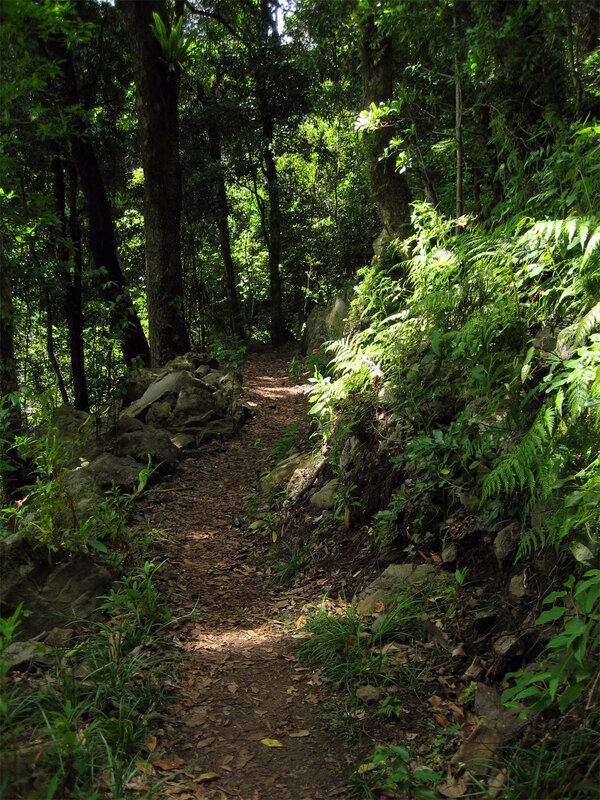 Being an avid nature lover myself, i am always game for a good hike! This seems to be one of them!